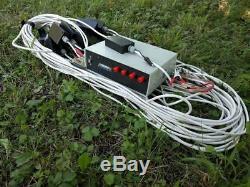 20 electrode ground resistivity meter. Device is useful to imaging layers and locating non metal large objects in soil , as tunnels , structures....... Maximum Output Voltage 450 Volts, 900 V peak to peak - Output constant current : 1mA, 10mA, 50mA, 100mA, 250mA. Maximum Output Power 50 Watts. 24 Bit Analogue to Digital Conversion. Waveform Square 0.1Hz - 25Hz. 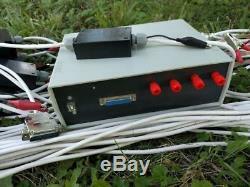 Electrode spacing 2m -- Automatic electrode contact test - Possibility to measure IP - 12 V DC power supply. Software export Res2dinv file format. You need Windows laptop, lead acid battery 12V 10Ah(or more) and 20 simple. Stainless steel electrodes 6mm x 400mm. Windows laptop, lead acid battery 12V 10Ah(or more Ah) and 20 simple. Resistivity meters up to 250 electrodes, electrode distance up to 70m. Resistivity meters up to 250 electrodes, electrode distance up to 70m, current up to 1.5A. 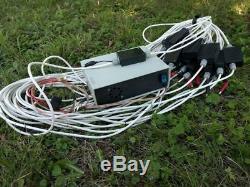 Ground penetrating radars with antennas from 20MHz to 2500MHz. The item "Ground electrical resistivity imaging system" is in sale since Monday, July 16, 2018. This item is in the category "Business & Industrial\Light Equipment & Tools\Hand Tools\Measuring Tapes & Tools". 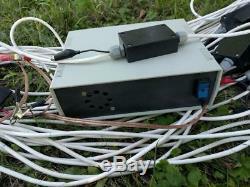 The seller is "valchev_gpr" and is located in Pleven. This item can be shipped worldwide.